Troop 257 Vows to “Stand Beside Her” « Girl Scouts of Gulfcoast Florida, Inc.
Several months ago, Girl Scouts of Gulfcoast Florida joined the national Stand Beside Her movement. It is a call to action for women and girls to band together and support each other, end comparison and competition, and create more collaboration. The year-round initiative was created by Girl Scouts Heart of the South, and is recognized by Girl Scout councils and other groups and organizations across the country. Troop 257 from Sarasota took a particular interest in Stand Beside Her, and decided to take action. “Our troop is interested in community involvement and making a difference in the world,” said troop leader Jeanne Koren. Some of the girls in her troop had noticed a difference since starting middle school in the way they feel about themselves. This directly affects self-esteem, and can have a negative impact on a girl’s ability to reach her full potential. “When we looked at the [statistics] online about this it was surprising to us,” she explained. The troop decided to kick off their own campaign with a “Chalk It Up to Being a Girl” Encouragement Project, one of several suggestions offered on the Stand Beside Her website. 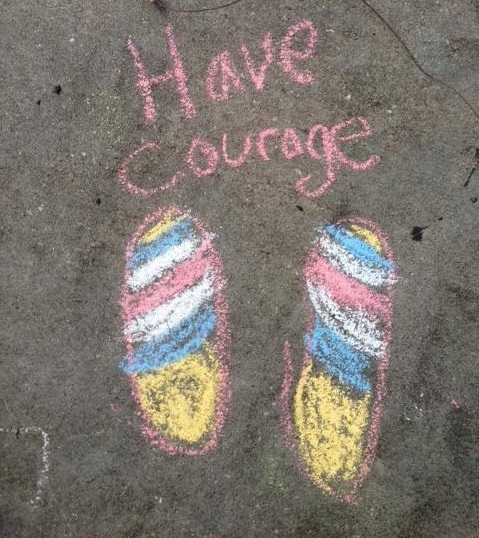 The concept is simple, but powerful: girls use chalk to draw outlines of their feet on a publicly visible sidewalk, and then write messages of encouragement next to them. Will you accept Troop 257’s challenge? How will you and your troop “Stand Beside Her?” Email your stories and photos to lorit@gsgcf.org. This entry was posted in GSGCF Blog and tagged girl leadership, girl scout troops, Girl Scouts, Girl Scouts of Gulfcoast Florida, Self-Esteem, Stand Beside Her, troop leader.